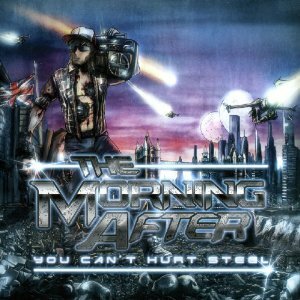 Okay, after loving the ’80s melodic rock-meets-modern rock/metal sound of Legacy so much, I decided to check out The Morning After’s debut album You Can’t Hurt Steel. It’s a less pleasant offering because metalcore permeates throughout most of the songs complete with those harsh growling vocals. I like when bands are influenced by Avenged Sevenfold, I just don’t like when those influences are from A7X’s metalcore years. The Morning After still has their melodic moments but nothing like what is to come on Legacy, the songs on You Can’t Hurt Steel are heavy and fast. This is heavy metal and I think with their follow-up they toned their sound down to be more in the range of hard rock. Musically, I really have no complaints because unlike most metalcore bands there is tons of melody here along with the chugging riffs and shredding solos, the problem is when the metalcore vocals come in but thankfully clean vocals are used the majority of the time. The intro “Metropolis” is hilariously deceptive as to what is about to be unleashed throughout the rest of the album. It’s epic AOR featuring keyboards and it’s jarring when the modern metal of “Lost In Time” kicks in. It’s not until “In The Heart of the Young” that the album finally lets up and allows you to breathe and see where the band was heading for the next release. Overall, You Can’t Hurt Steel is a good melodic modern metal album that is well worth exploring but if you’re like me and backtracking from Legacy, you may be in for a bit of a shock from the metalcore influence. I read about this band & album in an issue of UK’s Classic Rock magazine where they gave Legacy praise and the reviewer stated “there’s as much Def Leppard and Iron Maiden in the mix as there is Sweet and Queen”. That grabbed my attention so I had to check this British band out for myself. In their own biography, The Morning After says they “combine the exuberance, showmanship and melody of classic 80’s metal and pop with a gritty backbone of the metal and hard rock of today.” A lot of times band bios are just fluff and the young bands seem to oversell themselves with them but that description is dead-on and was exactly what I was thinking. If you took a AOR added a some glam metal and then added a band like Avenged Sevenfold that’s The Morning After. These guys know how to write melodies and they know how to work the twin guitar attack that Iron Maiden & Avenged Sevenfold have worked so well in the past. I hear a lot of Maiden by way of A7X in these guys because the songs are done in a modern style while still appealing to ’80s metal heads/melodic rock fans. Songs like “Nightmare Planet” & “Seasons” sound like something you would hear from A7X during one of their more melodic moments. I definitely hear Queen & Def Leppard influences in the way the vocals are structured and layered and from the production as well. I don’t want people to get the idea that these guys are as heavy as Avenged Sevenfold, they aren’t, I would consider The Morning After more hard rock than heavy metal but they walk the line having a classic yet modern sound. In that regard, they also should appeal to fans of Black Veil Brides, Endeverafter, The Darkness and Bang Camaro. 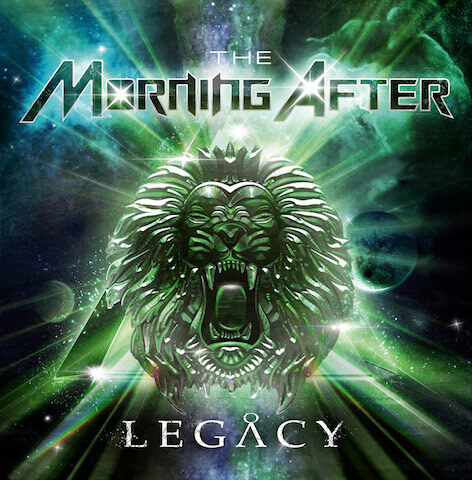 Legacy is a refreshing album where the world of ’80s rock/pop & metal meets the current scene. It’s full of great lead & backing vocals, wonderful melodies, shredding guitars and plenty of headbanging hard rock moments. Great album from 2011 that I unfortunately wasn’t aware of until 2012.